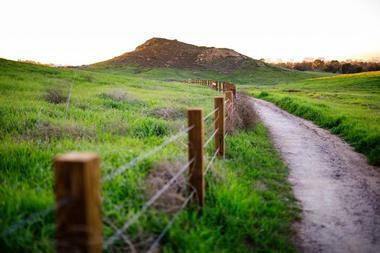 Orange County is blessed with great weather and spectacular diverse natural surroundings that range from mountain ranges to the coast of the Pacific, so it&apos;s no wonder that hikers have a huge number of opportunities to explore nature, challenge their fitness, and enjoy magnificent views. Many trails start in the urban areas and quickly bring hikers to a completely different world of peace with nothing but the sound of birds and the wind. Most trails are open to hikers, bikers, and horseback riders. San Clemente&apos;s Ridgeline Trail is a fairly easy paved 4.7-mile round trip hike along a ridgeline high above the city of San Clemente, with an elevation gain of 1,545 feet. The trail starts at the end of Calle Cordillera and follows the ridgeline until you reach the water tower, which is the turnaround point. Enjoy the views in all directions - towards Dana Point marina, the Santiago and Modjeska peaks, and sometimes even San Clemente and Catalina Island. The trail is pleasant all year round and you can even take your dog with you. The Panhe Nature Trail is an easy 1-mile hike, almost flat, perfect for taking a family for a walk through beautiful elderberry trees, coyote brush, and sage. Keep an eye out for the animals that live in the lush environment - rabbits, coyotes, bobcats, and, on rare occasions, the elusive mountain lion. Dogs are not allowed on this trail. The trail starts at the San Mateo campground and is very close to the San Onofre State Beach. To extend the walk, take a 1.5-mile trail that will bring you to the surfer&apos;s Trestles beach. You can spend the night at the Cristianitos or the San Mateo campground.